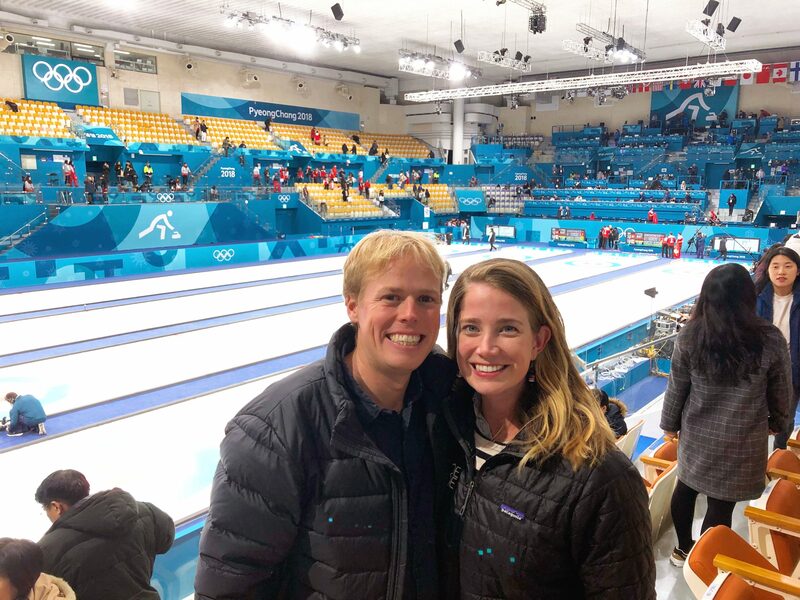 We’ve written about this multiple times, but going to the Olympics was one in a series of decisions that might have seemed irresponsibly expensive and prohibiting to us when we first started traveling, but by changing our travel approach to focus on experiences rather than time or money spent put an event as novel as the Olympics at the top of our must-do list. It was never a matter of whether the Olympics would be worth it. I am a die hard Olympics fanatic. In San Francisco when I didn’t have a tv I hung out at a sports bar (not my usual venue of choice) almost every day so I could watch them. I have even been to two different games- Atlanta 1996 and London 2012. Though I don’t really remember the 1996 games (I was 8) I had a great time in London, and always knew I would want to go to another games. I am aware that the Olympics have become a strange expression of power and wealth and often leads to blatant waste of space and resources. (Umm, have you seen this documentary about who was responsible for the modern games? Eye opening.) The games are also rife with scandal both for the athletes and the countries hosting them. So critics of the games are not without basis or even points I can agree on. That said, I can’t help my diehard fandom. The way I see it, the games are a way for a country to share its history and culture with the world as people gather from all over the world for some good spirited rivalry and celebration. Short of getting political, I think it is increasingly difficult for those of us from the United States to come together in any sort of unity on almost anything these days. The Olympics is one of the few places where who you are, how you identify, or what you believe, aren’t factors for inclusion. Enthusiasm for the American team is the one and only requirement for bringing us together, and I find that simplicity truly refreshing. So for all its faults, the unencumbered unity and good spiritedness is the way I’ve always experienced the games and I hope that’s the way I always will for as long as they continue. The Olympic ticketing process combines a complicated price bracket system with a lottery allocation system that makes getting a seat you can afford at an event you want somewhat of an art. For reference when I went to the London Olympics with my sister in 2012, I entered the lottery in March 2011, was awarded the tickets in April and finally purchased the tickets in June 2011, more than a year before the actual games! For the 2018 Olympics we were buying tickets a month before the games, so we were left scraping the bottom of the barrel, or more accurately, everything left at the top- the gold medal games and the top of the price brackets. So it took some combing through the remaining available tickets to find ones that weren’t outlandishly expensive or overlapping in time. Eventually we settled on three events: men’s arial skiing qualifications, men’s hockey, South Korea vs. Canada, (which were back to back days) and the bronze medal game of men’s curling (which was almost a week later). The Pyeongchang Olympics were held in two main parks- Gangneung for ice sports including hockey and curling, and the Pyeongchang park which housed the main stadium used for the opening and closing ceremonies and linked up to most of the mountain sports. There was also a satellite park Phenix park where we saw our skiing event. 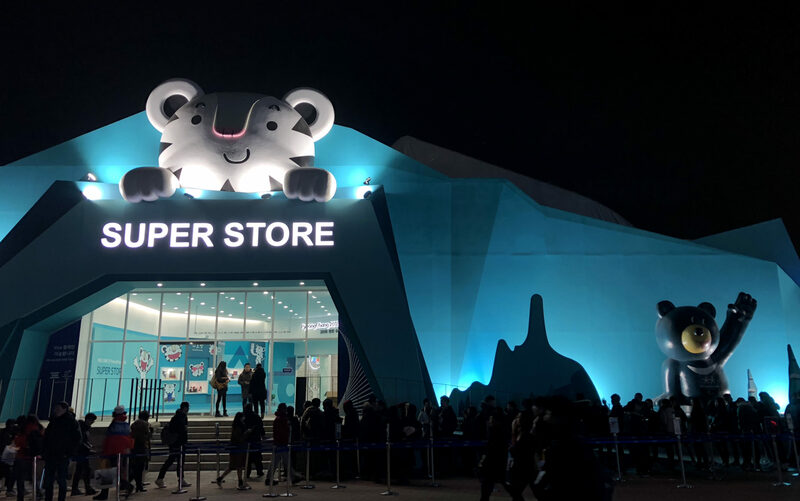 In addition to being sports oriented, both parks showcased cool, unique, Korean brands, hobbies, and events. We spent more time at the Gangneung Park where both hockey and curling were held. Outside the Gangneung train station there was a, for lack of a better word, mall, with a wide variety of Korean home, food, and lifestyle brands, a separate section for musical performances even a place to participate in or observe a traditional tea ceremony. They also had a small “street food” court which was nice to have because there weren’t a lot of other restaurants open the days we were there due to the lunar new year. 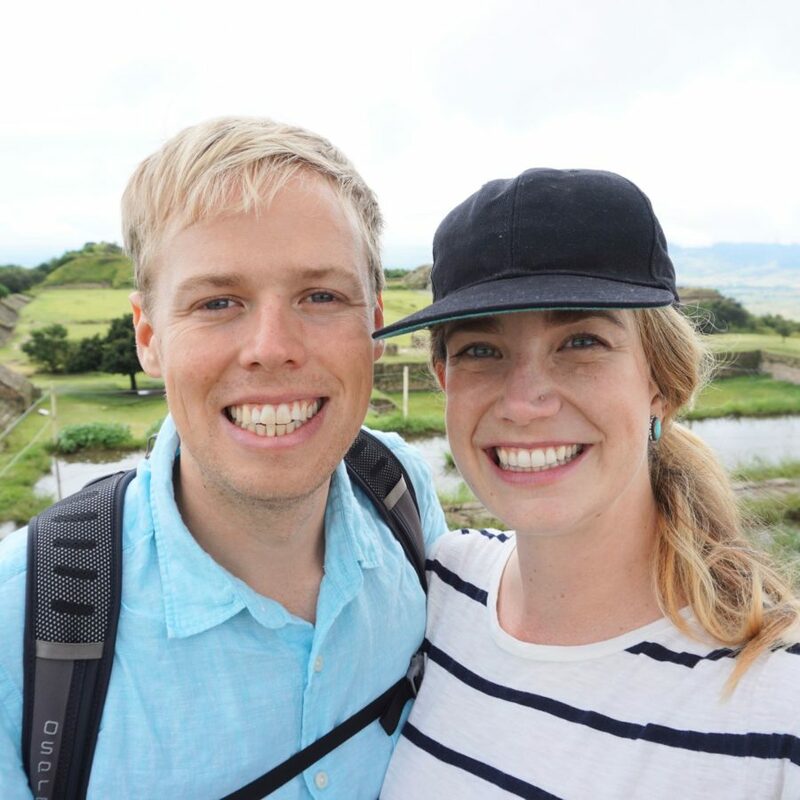 One day we decided to go to the Pyeongchang park to see the Olympic flame and to catch a medal ceremony (unfortunately, we didn’t end up seeing one). 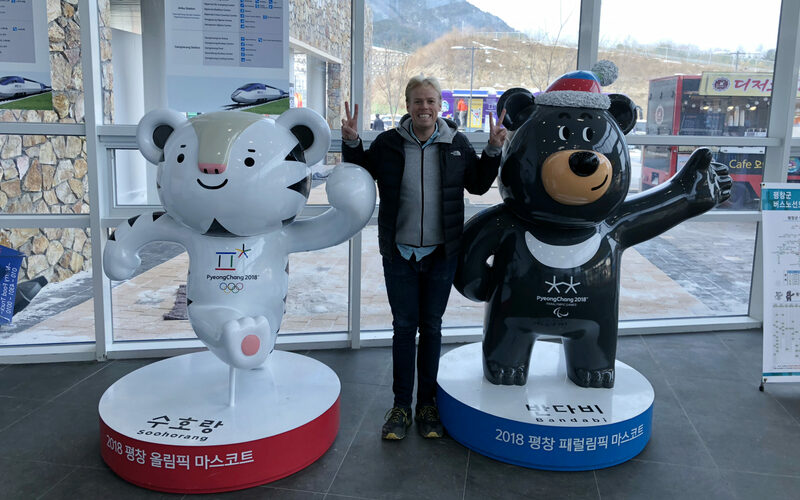 The park was the main shuttle point for the sled and most snow sports, so instead of being a main place to see sports, Pyeongchang Park was turned into more of a cultural venue. They even granted access to the park for $5 so everyone just go and wander around, so the day we went we saw lots of Korean families enjoying all the park offerings. 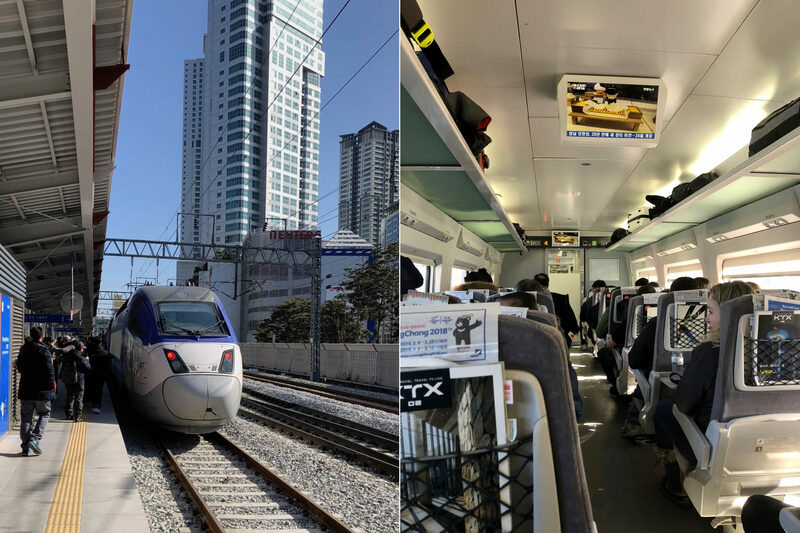 A major highlight of the games was the brand new high speed, KTX train line that was built just for the Olympics. The trains were incredibly quiet, comfortable, very clean and very fast. Using an app, Jeff clocked our full speed at 150 mph! We rode it the full length a total of 4 times and every time we couldn’t get over how great an experience it was. However getting tickets turned out to be a different story. 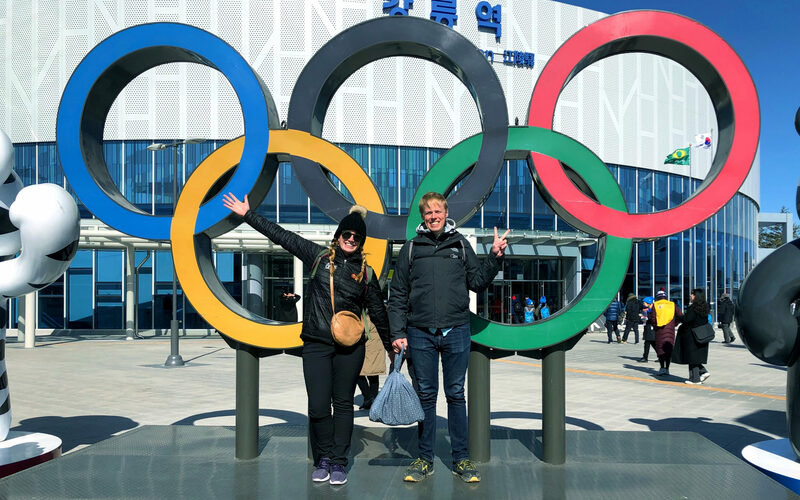 Since we decided to go to the Olympics pretty late, our hotel options in the PyeongChang area were limited, either the prices were way out of our budget or places that still had availability were extremely far from the venues. So before getting to Korea we decided to base ourselves in Seoul and take the high speed train to each of our events. The online buying process was pretty confusing so we figured we could buy train tickets in person when we arrived which was a few days before our first two events. Epic Fail! We didn’t do our research and it turned out the first week of the games fell during the Lunar New Year, Korea’s biggest holiday when the entire country is on route to their hometown to celebrate with their families. We basically had the same chance of getting round trip train tickets as a person in the US would if they tried to buy a plane ticket in person at the airport the Wednesday before Thanksgiving. So we had to improvise. 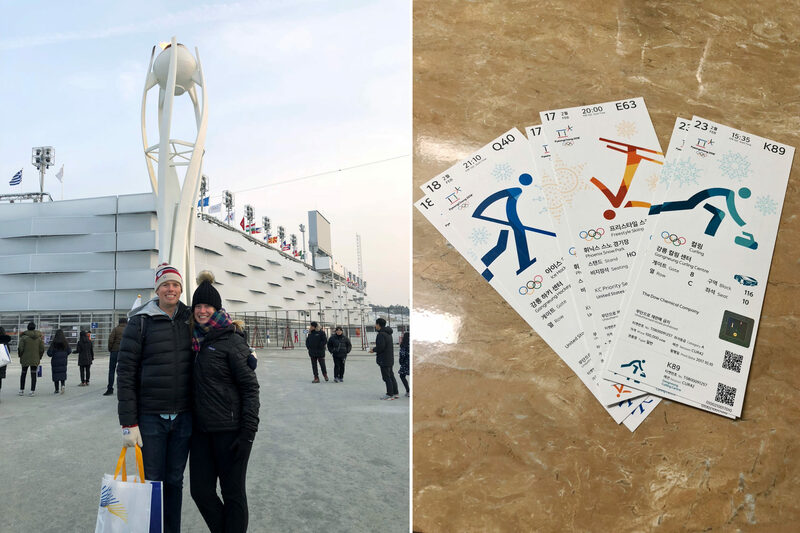 With the help of a kind English speaking volunteer at the train station, we were able to find two remaining tickets to the games the morning of our first event from one of the outlying stations in the Seoul area but there weren’t any available for us to get back to Seoul until late the next day. We scrambled online and ended up booking an exorbitantly expensive room at a Pension (which is essentially the equivalent of a family owned mountain bnb) that was close enough to Phoenix Park to see it from our room, but due to the mountain roads, took about 30 minutes to get to. It turned out to be a costly mistake not booking a train ticket or hotel earlier but we were glad to have been able to find a place at all. When we arrived we discovered another hiccup in our new plan, the manager of the Pension didn’t speak a word of English and we didn’t speak a word of Korean. Due to the remote location of the hotel we needed her help in getting us a taxi and before we could even start worrying, she whipped out her phone and used the google translate app to ask us if there was anything we needed. For the time we were there we communicated entirely with the help of the app, about everything from taxis, to where to get breakfast, to our check out time. It was one of the times I’ve been most grateful for technology in my life. Of all the events, I was most excited for skiing. I don’t have much experience with any winter sport, but anything related to ski jumping always leaves me incredibly impressed. I was also the most worried about this event because it was outside and at night which meant it was going to be freezing, literally. Our wardrobes were not prepared to protect us from temps in the high teens with negative windchill so we wore every single article of clothing we had and told ourselves we would make it. In spite of the cold the organizers did everything they could to make the event fun. The volunteers working check in and security were chatty and very helpful. In the stands they played upbeat music and had an American announcer who did his best to make jokes between each run. They also had a DJ who played music during each run and would time the beat dropping in the song to the skier’s landing, with almost perfect accuracy. Mercifully for our freezing noses and toes the event only lasted about 90 minutes but we could have easily enjoyed ourselves for another hour in the lively atmosphere. When Melissa and I went to the Olympics in London, we went to a woman’s soccer game that was Brazil vs. Great Britain and it was the most fun event. The energy of the crowd was magnetic and we had a great time. So when we were buying tickets I specifically was hoping Jeff and I could go to an event with a Korean team, and with hockey we chose very well. The stands were packed, with Canadians, who are obviously big hockey people, and with Koreans. Even before the game started there was a clear rivalry happening between the crowd with lots of cheering and chanting that never quelled through out the entire game. We had incredible seats, four rows back from the ice and we were surrounded by Koreans holding signs and waving flags. 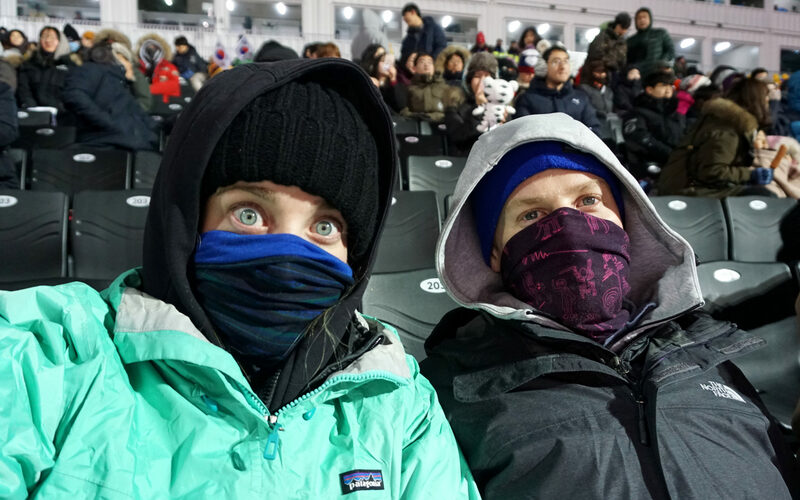 Thanks to a very kind American sitting next to us who lived in Korea, we were introduced to the entire Korean hokey culture and he helped fill us in on all the rules of the game that we didn’t know (which were basically all of them). He said hockey was just starting to become popular in Korea so the crowd were not only cheering for their country but for upandcoming athletes they knew from the Asia League Ice Hockey and other minor league teams (the Internet isn’t totally confirming this but the crowd did seem to know many of the players so I’ll go with it). The game was a one-sided match from the start, with Canada being the obviously stronger team. But that didn’t stop the enthusiasm or energy from the crowd on either side. Sometimes everyone was chanting so loudly that it was impossible to hear the announcers, and at one point we even had a wave going that lasted a good five minutes. Everything about the event, the energy, the high speed game, the rowdy crowd made this my favorite event of the games. Curling was our wildcard event. We knew almost nothing about the sport before going but we know a lot of people who consider it their favorite event so we figured we would enjoy it. Immediately when we sat down we realized we would not make it through the event without some help with the rules so we texted Jeff’s friend who plays intermural curling to give us an overview (why we didn’t do this before we got there, I can’t say). So for the first 15 minutes or so we were “those people” in the stands on our phones, but it was so helpful! Once we understood the rules we really got into the intensity of the game. Unlike hockey we didn’t know who we would see until just a day before and who ended up being Canada vs Switzerland. It was fun watching the dynamic between each team and their coaches. We really got into imagining what they might be saying to each other and pretending we understood their tactics. The Canadian contingent was much more represented in the crowd and used every spare opportunity to chant and cheer which was funny given the quiet, focused nature of the game. Towards the end it seemed like one particular group of Canadians had taken advantage of the stadium bar and their chants got louder and less coherent, which I found hilarious given how little it matched the tense atmosphere. Unfortunately for them, the Swiss won the game and the bronze. Though this post is already very long, there are few other little things I want to touch on that made the games so special. One was the mascots. In my experiences watching it on TV and at the 2012 games, the Olympic mascots seem like somewhat of an afterthought. 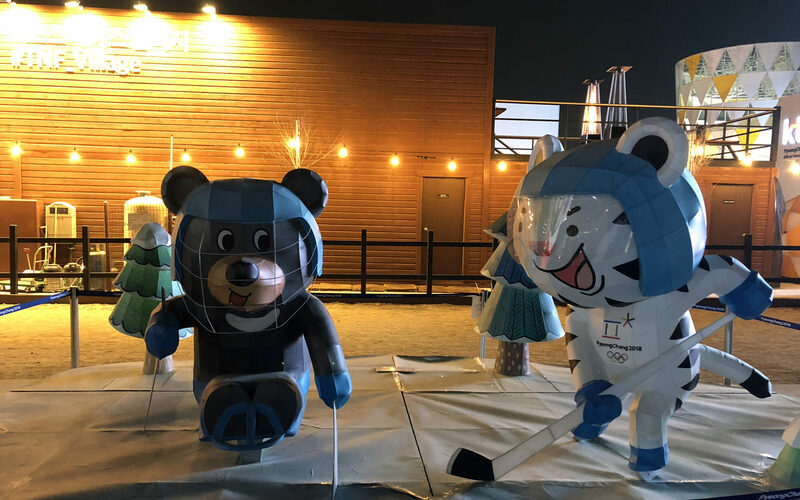 In Korea, it was a whole different story, the mascots, Soohorang (the tiger) and Bandabi (the bear) were key players in the feel and look of the games. I especially loved the way the way they highlighted the Paralympic games by featuring the Paralympic mascot right along side the Olympic mascot in all of the branding. I also learned that Olympic pin trading is an incredibly popular hobby. Before heading to Korea, my mom brought me several pins that I had from the 1996 Olympics so I was wearing those proudly during the games and I bought two more at these games but I didn’t think much of them after that. Then while we were wandering around the Pyeongchang park, I found a pin trading building, where several people who had years and years worth of pins were set up ready to trade. I spoke with a few of them, and they each had their own preferences and trading policies. I wanted to make a trade for a 2012 pin so I could have full representation of my three games, but I liked all of my pins too much to let them go. 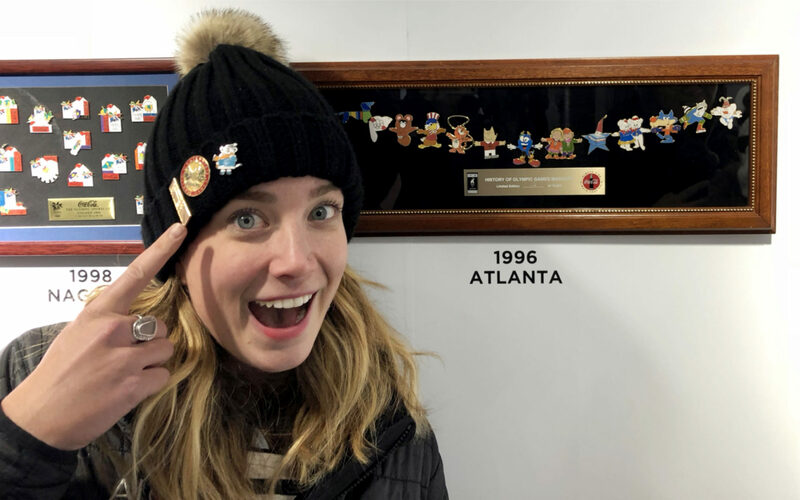 Now I know, whenever I do attend another olympics, I’ll buy a few extra pins so I can trade for a London 2012 one and have myself a complete set. Going to the Olympics was a risk that paid off. Even with all of the downsides of booking the trip last minute we had a blast. I have definitely learned to love winter sports as much as summer sports, and I can’t wait to go back to another Olympics some day.